The recent slide in the value of the dollar has focused the eyes of the world on the foreign exchange markets, where the volume of trading has exploded to around $1.9 trillion a day. In April 2004, when 52 central banks and monetary authorities worldwide collected data on turnover, as they do every three years, they found that daily global turnover was up 57% at current exchange rates and 36% at constant exchange rates from April 2001. The triennial survey also confirmed that the UK remains the center of the foreign exchange world, with a market share of 31.3%, followed by the US with a 19.2% share, and Japan with 8.3%. Daily volume in the US soared 82% since 2001, slightly narrowing Britain’s lead. Daily turnover for US derivatives markets, such as forward-rate agreements, interest-rate swaps and foreign exchange options, surged by 164%. It is clear that increased activity by hedge funds, the fast growth of online foreign exchange trading systems and growing international trade and cross-border investing are contributing to a major increase in currency-trading volume. This has occurred despite a continuing consolidation among dealers. Global Finance has selected the leading foreign exchange banks in 70 countries and regions, as well as the best online foreign exchange trading systems and the best bank for foreign exchange research. 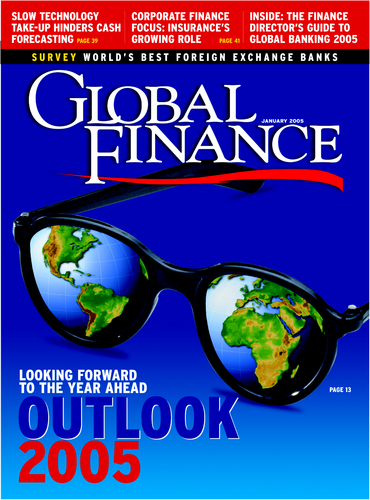 With input from industry analysts, corporate executives and technology experts, Global Finance editors selected the winners based on objective and subjective factors. Criteria included transaction volume, market share, scope of global coverage, customer service, competitive pricing and innovative technologies.